Before coming to Oxford I completed a Bachelor Degree in Agronomic Engineering and a MSc in Plant Sciences, both of them in Chile. My previous research focused in comparing different approaches to assess stomatal conductance in Mediterranean vegetation, where, since the majority of the season experiences drought, leaf gas exchange is jeopardized. One of the things that fascinates me the most, is the search to understand the underlying mechanisms behind Nature's complex processes. With a particular focus on ecophysiology and biometeorology, I have tried to apply several models to understand both matter (CO2 and H2O) and energy exchange, from leaf to canopy level. Even if arid and semi arid ecosystems are fun and challenging to study, I decided to direct my focus to rain forests, where the majority of the world's ecosystem exchange takes place. I joined the Ecosystem Laboratory in 2013 with a particular interest in studying Environmental Change feedbacks in Amazon vegetation. My research aims to merge architectural models of the canopy (3D information regarding plant topology and branching patterns) with Process Based models, that aim to represent photosynthesis, stomatal conductance, carbon allocation, and several other plant physiological processes, thus resulting in the so called Functional Structural Models. 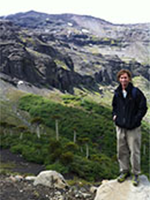 The result of this research should help us to understand how crown exchange behaves at different canopy levels and how changes in environmental factors (eg: increase in atmospheric CO2 concentration, temperature and a decrease in soil moisture) could affect the whole ecosystem exchange and planet's control over today's rising CO2 levels.